With the Veterinary Feed Directive (VFD) on the horizon, one Virginia feed mill and BioZyme® dealer has worked diligently to create its own line of feed to help keep animals healthy. The A+ line of feeds includes cattle formulas for both beef and dairy cows. Currently CFC is offering a creep feed, cattle mineral and a commodity pellet. Future plans include developing a ration for growing cattle. All products in the A+ line include Amaferm. Reames said the specific feeds are in the process of receiving their trademark. At least one feed in the A+ line is already available, with plans to start marketing the products soon. 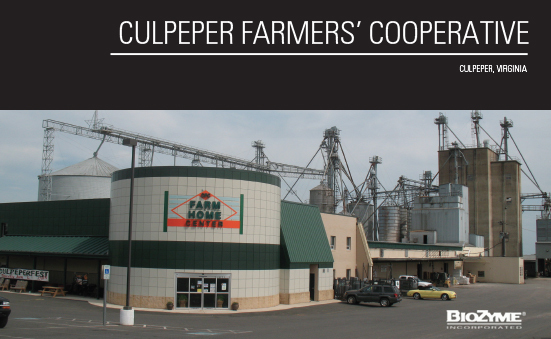 CFC Farm & Home Center, which includes a feed mill and five retail stores, conducted educational meetings for its customers this fall to inform them of the changes with the VFD and introduce the A+ program to its customers. Reames said the dialogue was positive, and she hopes once the producers try the products and recognize the health benefits, they will be on board. In addition to increased performance and keeping cattle healthy, Reames shared some other key roles the Amaferm advantage has assumed for CFC Farm & Home Center. She says that Amaferm has reduced the use of antibiotics and has also given natural and GMO-free producers options for their cattle. Another benefit to using Amaferm in their mill is many producers run both horses and cattle together on smaller acreages and buy a general purpose feed, which has reduced ionophore usage. It’s easy to see why Amaferm gets at A+ at CFC Farm & Home Center. The health benefits will assist producers looking for an alternative to the VFD to keep their herds healthy.